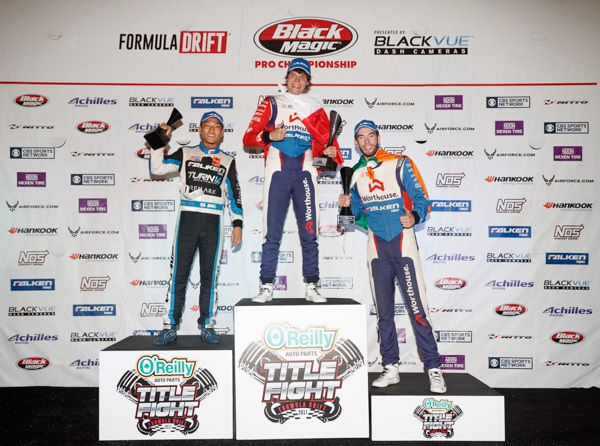 Long Beach, Calif. – October 14, 2017 – Formula DRIFT Black Magic Pro Championship presented by BlackVue Dash Cameras returned to Irwindale Speedway for Round 8: O’Reilly Auto Parts “Title Fight”. 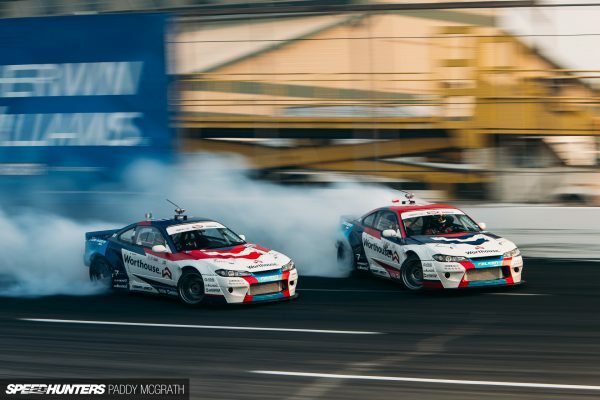 Piotr Wiecek in the Worthhouse / Falken Tire Nissan 240 takes home his first Formula DRIFT victory and clinches Rookie of the Year honors, while his teammate James Deane in the Worthhouse / Falken Tire Nissan 240 clinches his first Formula DRIFT Championship. Deane completed an impressive season with four event victories and a third place finish at tonight’s finale to secure the championship. 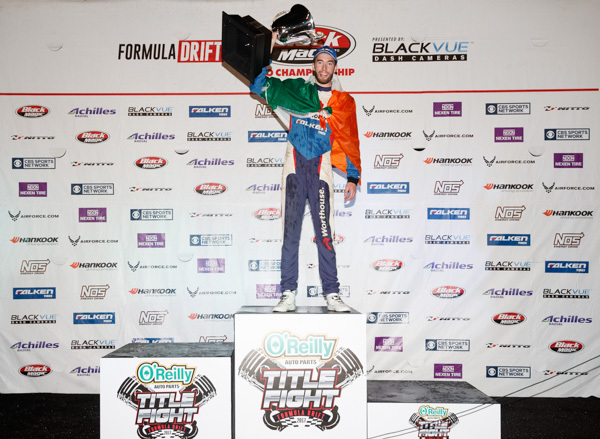 His sponsor Falken Tire swept the podium and won the Tire Manufacturer championship for their second consecutive time. Toyota wins their fourth consecutive Manufacturer championship. The sold out crowd came for one last Formula DRIFT finale at Irwindale Speedway, which is often referred as the birthplace of US drifting. The Livestream drew over 1 millionviews over the course of the event. For more information visit, www.formulad.com and find Formula DRIFT on Instagram @formulad, Facebook www.facebook.com/formuladrift, Twitter @FormulaDrift, and Snapchat – formula_drift. Tune into Formula DRIFT on CBS Sports and check your local listings for airtimes. The speed at which the 2017 Formula Drift season is passing, is frightening. It feels like only a couple of weeks ago that James Deane and Piotr Więcek shared their plan to compete a full FD campaign in 2017, but in reality, it was 10 months back. By the time the Irwindale final comes around in October, it will have been over a year since the decision was made. From the outside, expectations have been high for the newest team in the paddock. In particular, expectations for what James would achieve in his first season have been astronomical. 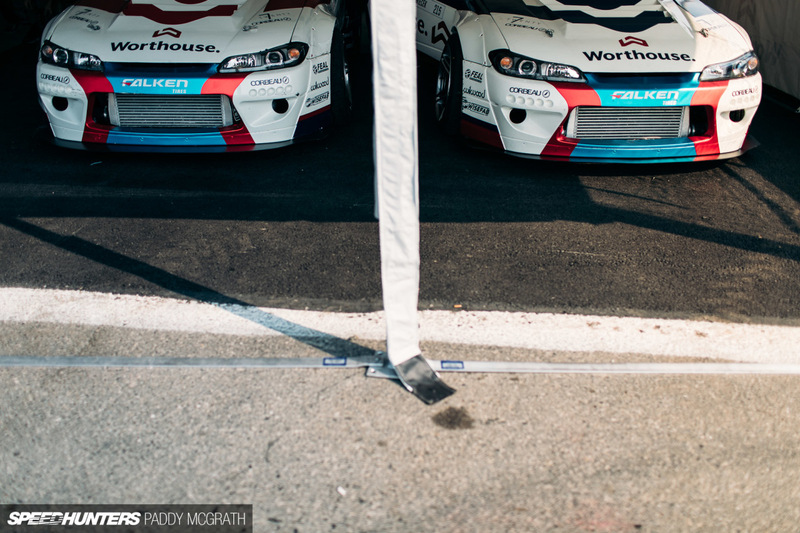 It hasn’t been quite that straight-forward, but what the Worthouse Drift Team have achieved in what has only ever been intended as a learning year, has far exceeded even their own expectations. When I caught up with the team in Monroe last week, James was narrowly leading the points standings with Piotr being miles ahead of his nearest rival for Rookie of the Year honours. The cars had been transported from the previous round in Montreal, all the way back to the Bridges Racing workshop in Huntington Beach, California, before making the long drive north along PCH to Washington state. While at Bridges, both cars were checked over, and in Piotr’s case, repaired after his run in with the wall at the Autodrome St-Eustache. 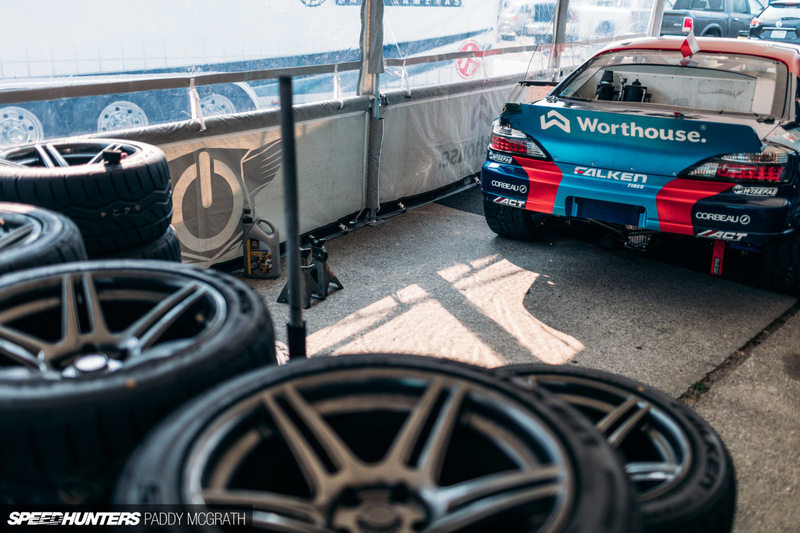 Highlights of Team Falken at Formula D’s Round 5: True North in Montreal, Quebec, Canada. The new Worthouse Drift Team’s duo of Piotr Więcek and James Deane will make their debut in the Formula DRIFT Pro Championship in Long Beach, CA this weekend aiming to make their mark on the US drifting scene after years of dominating in Europe. At the time of writing, there’s just one month and 18 days to the first round of the 2017 Formula Drift championship. While we might have to wait until then, for some, the new season has been underway since the day immediately after the 2016 Irwindale finale, if not earlier, as is the case for this particular story. By now, you’re likely aware of James Deane’s and Piotr Więcek’s intention to contest the entire 2017 FD season; you might also have seen the renders and details of their new cars. For the newly-formed Worthouse Drift Team, these announcements and reveals may have been the easiest part of the puzzle. The real challenge is in the preparation for competing a full championship on another continent. Further to this, there’s the extra challenge of building the two new cars some 2,000 miles apart from each other. The cars for all intents and purposes will be practically identical; the only considerable difference being that James’ car will be right-hand drive while Piotr’s will be left-hand drive. This was a deliberate decision, as it means the team only needs to carry one set of spares from event to event. It’s also meant that the two new teammates have had to co-design the new cars, with compromises being made along the way. 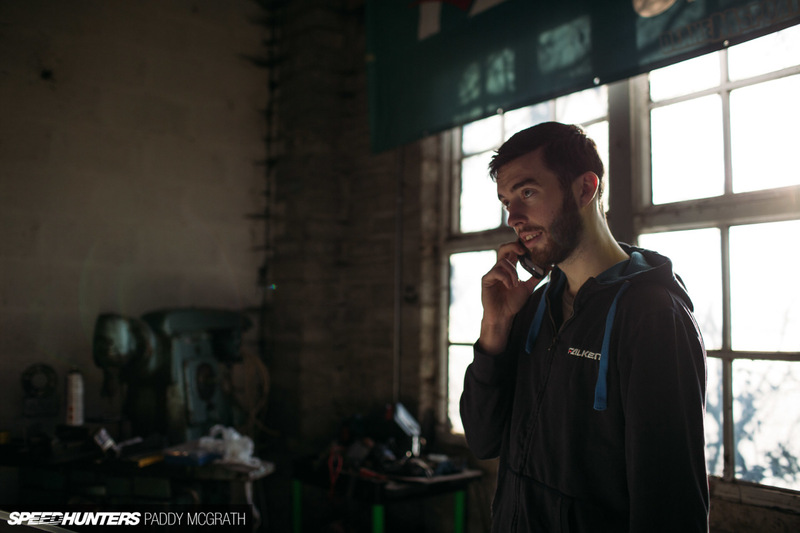 It has also meant a near never-ending stream of phone calls and messages between both sides of the team in Ireland and Poland. To keep things simple, I’ve been following James’ side of the build at Deane Msport while Piotr’s build progresses in Poland.